Sometimes planning the details for a quilt gets me really excited. Executing them usually takes a bit more time and patience than I had planned (ha! ), but I am glad that I have a pretty stick-to-it nature as well as an inner voice that tells me to take a break on occasion. As you saw in my post about Sunburst last week, I have started to explore using binding as part of the quilt design. This week, as I was putting the finishing touches on my Beacon quilt, I explored the idea a little bit more. 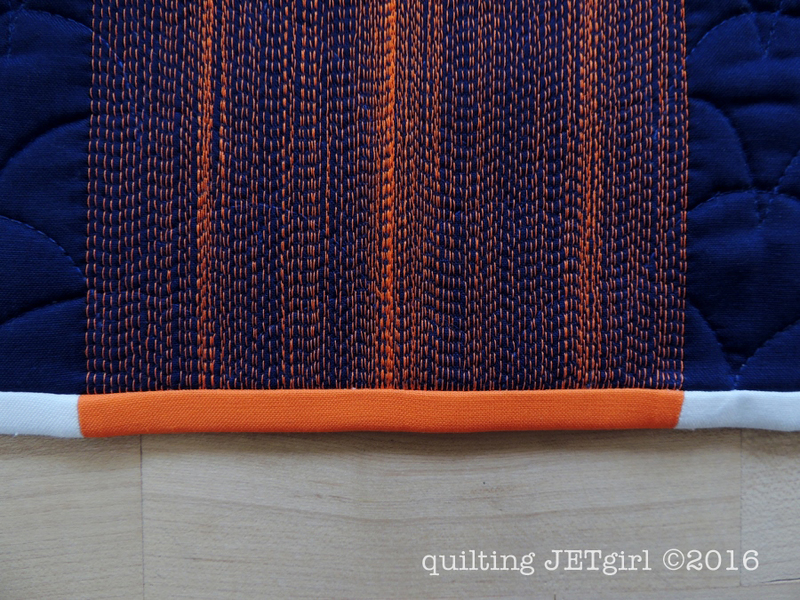 I had always known that I wanted the majority of the binding to be white, and I knew I was going to add a strip of bright orange above the central beacon point for the quilt. As I was putting the finishing touches on the quilting, I got an idea for something else in the binding over top of the two side beacon points. Because the binding is white, I knew that if I split the binding in half lengthwise and inserted the orange (Kona Torch), that it would “glow” through the front when folded over. One last look at the binding above the central beacon point that I had always had planned. My entire thought process and premise behind the design of the Beacon quilt is that we all have an inner light; an inner strength. I wrote the pattern with prompts to have you think about yourself (or perhaps the recipient of the quilt) and consider that inner light and how to let it shine out into the world. By saying yes to these design details, my heart kept singing, “This little light of mine, I’m gonna let it shine…”. I am very excited about this finish and look forward to sharing much more about it with you soon. Lovely story behind the quilt Yvonne!!! You have great attention to detail, and the binding is inspired. I love your thought process behind the quilt, on reflection that’s what I’m doing this year when, after over 10 years of patchwork and quilting, I started my blog and exposed myself to the world. I think I’m still feeling a bit shy though, hence the profile pic of me hiding behind my sunglasses. Looking forward to seeng the entire quilt, it’s quite exciting. I love that children’s song and hold it in my heart. A nice addition of detail Yvonne. I like the story behind the pattern. Those orange lines and the pop and hint of orange in the binding do look like they would be very effective. Those details make a big difference. I look forward to seeing the finished quilt. I think binding can be a important detail that we just kind of skip over and do. At that point everyone is so close to a finish, it’s just like lets get it on and be done. I love the thought you put into this detail on this quilt. I can’t wait to see how it all come together, big picture. AH! That is the coolest binding trick I’ve ever heard! Thanks for sharing your thoughts and your process. You’re right, sometimes it’s the details that make a project stand out as special. And now I have that song in my head!! Yvonne this is going to such an amazing quilt. Your attention to detail is always worth the wait! Clever, brilliant idea with the binding! You are so good at the tiny details, Yvonne. I love the concept of extending the design into the binding and really, really like the ways you have worked with that here. Ooh. Nice. I like that binding. Very nice! I’m a huge fan of binding details! Good Morning Yvonne! Adding the bright orange was a terrific idea it adds such a fabulous pizzazz factor. Plus using the matching quilting thread and quilting closely together like you did adds another great appeal factor. I truly appreciate the time that you take to think the process through and decide what you think will and will not work, yet are so willing to try new ideas. Thank you for sharing and have a fantastic creative day! The details really make the design speak the message. Shine on! Yvonne, I just went back to your original design work on this–it was already inspired. But now that you are actually creating it–amazing! 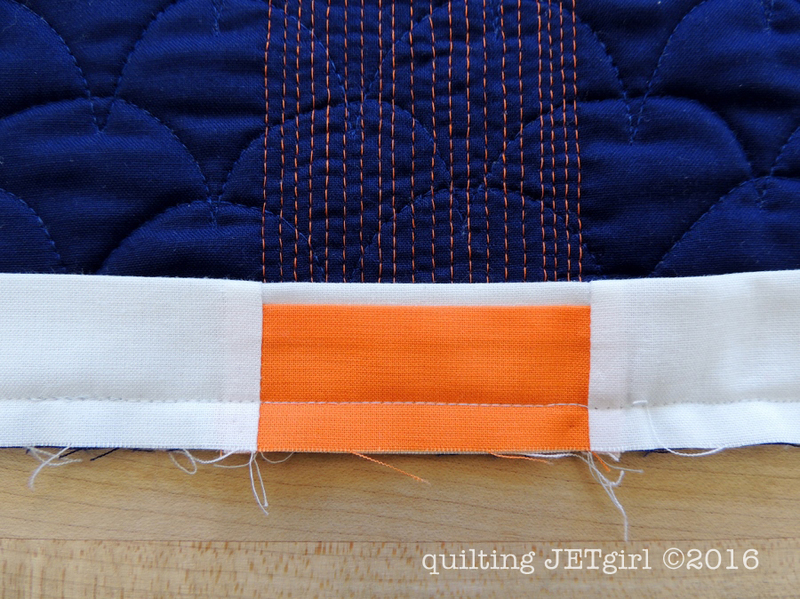 I really love your quilting work and the pop in the binding–and the orange thread against the blue knocks my socks off 🙂 I’m really looking forward to the big reveal! I love your attention to detail and how you know when the little things are worth the extra effort! That hidden orange piece is really going to glow when the binding is wet, that will be a sweet surprise for someone washing it! That is a really cool addition and I really like the straight line quilting over the clam shell quilting! Awesome Yvonne…my inner light is really struggling to reach the surface right now. Thanks for the reminder. I really enjoyed seeing the orange against the blue and the wonderful detail you are putting into this quilt. Great addition to your composition. “Highlighting” a great way to direct your eye to an important design detail. Thanks for the inspiration. As we all sing along…. 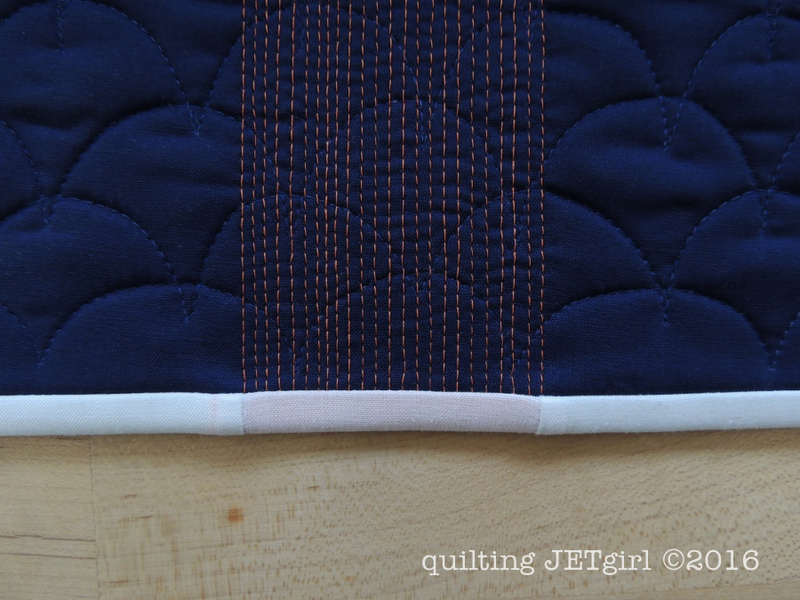 I love this binding element of the quilt. I love that you’ve been sharing tidbits, but the suspense is insane. I can’t wait to see the finished project. Oh yes, this is a lovely detail! Such a fun little detail, Yvonne! Great detail!! Thanks for the inspiration. Sometimes little details(no matter how time consuming) make all the difference. Great addition to continue the color without adding too much! This is a really interesting concept for the binding. Don’t think I would have thought of that. I do like to mix in a little color strip sometimes depending upon the design. It’s a great way to extend the design onto the edge. I love the special touches on your binding. I never would have thought about the glow showing through the binding, but I have seen something similar done with trapunto quilts.